Shares of frack sand producers are getting shellacked today after U.S. Silica Holdings (NYSE:SLCA) reported third-quarter earnings. As of 11:15 a.m EDT, shares of U.S. Silica, Hi-Crush Partners (NYSE:HCLP), and Emerge Energy Services (NYSE:EMES) are down 9.7%, 8%, and 10.6%, respectively. On top of the overall market decline today, U.S. Silica reported third-quarter earnings that were well below analyst expectations. Earnings per share were $0.08 compared to consensus analyst expectations of $0.59. Adjusting for one-time expenses related to acquisitions and newly constructed facilities, earnings per share were $0.44 per share. The reason for the massive whiff on earnings was much lower than expected pricing for facking sand in the third quarter. Many producers have elected to not complete wells lately because there simply isn't enough pipeline capacity to bring it to market. With so much new capacity coming on line from these sand suppliers, it is putting immense pressure on spot prices. The reason that Emerge and Hi-Crush are coming down with U.S. Silica today is not just because its sand prices were low, but also because U.S. Silica is able to protect its prices better than its peers with long-term supply contracts and last-mile logistics services. Hi-Crush does have some of these advantages as well to protect pricing, but it is also in the midst of a corporate transformation from a master limited partnership to a c-corporation. Emerge is much more exposed to the spot market and its offerings aren't as attractive to customers than U.S. Silica or Hi-Crush. For investors looking at the long term, the issues U.S. Silica mentioned in its earnings release seem transient. As pipeline capacity gets built out, it wouldn't be surprising to see shale drilling and well completion come roaring back. 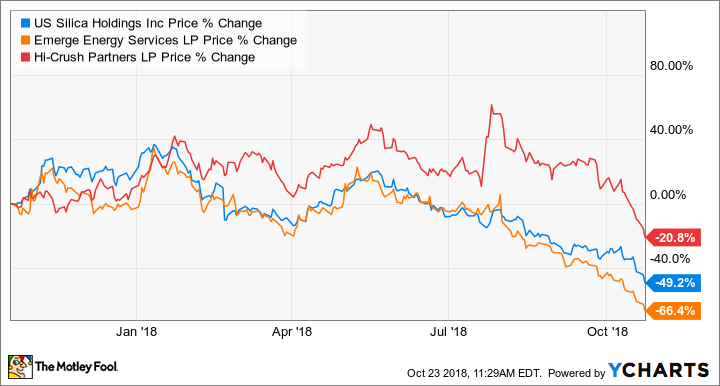 It may take a quarter or two for this rebound to happen, but of these three stocks, U.S. Silica looks like a dirt cheap stock worth reconsidering today.